Duoflect for Small Dogs and Large Cats is indicated for the treatment and prevention of flea and/or tick infestations in small dogs weighing 2 – 10kg and for large cats weighing over 5kg. 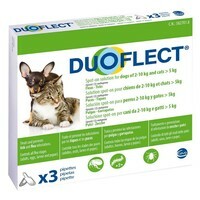 Developed with a new strength formulation of the tried and trusted combination fipronil and S-methoprene, Duoflect prevents the multiplication of fleas by inhibiting the hatching of flea eggs and the development of flea eggs into adult fleas for up to 8 weeks after application in dogs and up to 6 weeks for cats. Duoflect also treats and prevents tick infestations with immediate and persistent acaricidal efficacy for 6 weeks after application on dogs and for up to 5 weeks after application on cats. Each 0.7ml pipette contains Fipronil 121mg and S-methoprene 60mg.